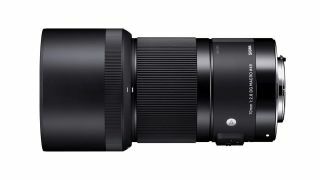 Update: Sigma has confirmed that the 70mm F2.8 DG Macro Art lens will be available with an SRP of £499.99 in the UK and $569.00 in the US. The Canon-fit option is set to be available later in May and the Sigma version will follow in June. A release date for the Sony FE version is still to be decided. Just ahead of CP+, Sigma has added to its other lens announcements this morning by taking the wraps off the new 70mm F2.8 DG Macro Art lens. With a 1:1 reproduction ratio, this is the first true macro lens to join the Sigma Art series. It's been designed to prioritise optical performance above all else, with an extending, floating, two-group focus mechanism configured to minimise aberration. The lens uses a focus-by-wire system, which eliminates a direct mechanical connection between the focus ring and the focus drive. Sigma’s algorithms, together with a new coreless DC motor, do the job of acquiring focus with minimal noise, while full-time manual focus is also available during autofocus. This is ideal for macro shooters who may need to adjust focus to the millimetre, a function that's further aided by the focus ring’s large angle of rotation. The lens is constructed of 13 elements in 10 groups, and it uses a nine-bladed rounded diaphragm to create vivid bokeh. The optical design incorporates two FLD glass elements, two SLD glass elements, and one element with a high rate of anomalous partial dispersion and a high index of refraction, as well as two aspherical lens elements specifically for close shooting. According to Sigma, all of this adds up to a lens capable of razor-sharp, well-delineated focus with beautiful bokeh. Encased in a dust- and splash-proof body, the 70mm F2.8 DG Macro is also compatible with specific functionality of the corresponding cameras. So, the Sony E-mount version can work with Sony’s continuous AF, for example, together with in-camera stabilisation and lens aberration correction, while the Canon-mount version is compatible with Canon’s Lens Aberration Correction functionality.